The 49 greatest actresses not named Meryl in modern film history, ranked by overall career, acting range, and movie resume. Films that best typify each thespian prowess are loosely ranked within. 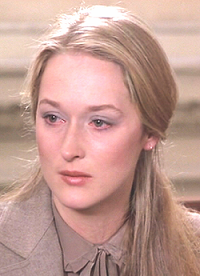 Meryl Streep: Sophie’s Choice, Kramer vs. Kramer, The Devil Wears Prada, Doubt, Out of Africa, Silkwood, The Deer Hunter, The Bridges of Madison Country, The Iron Lady, The Hours, Adaptation, The Post, Julie and Julia, The French Lieutenant’s Wife, Ironweed, A Cry in the Dark, Postcards From the Edge, One True Thing, Mamma Mia!, Music of the Heart, Manhattan, August: Orange County. Judi Dench: Mrs. Brown, Shakespeare in Love, Notes on a Scandal, James Bond Franchise, Chocolat, Philomena, Iris, The Shipping News, Mrs Henderson Presents, Cranford. Diane Keaton: Annie Hall, The Godfather II, Something’s Gotta Give, Reds, Marvin’s Room, Manhattan, Looking for Mr. Goodbar, Shoot the Moon, Mrs. Soffel, Baby Boom. Susan Sarandon: Dead Man Walking, Atlantic City, Bull Durham, Thelma & Louise, White Palace, Lorenzo’s Oil, The Client, Stepmom, Igby Goes Down. Faye Dunaway: Network, Chinatown, Bonnie and Clyde, Mommie Dearest, The Thomas Crown Affair, Three Days of the Condor, Barfly, Hurry Sundown, Puzzle of a Downfall Child, The Towering Inferno. Jodie Foster: Silence of the Lambs, Taxi Driver, The Accused, Contact, Nell, Panic Room, Brave One, Bugsy Malone, Inside Man, Freaky Friday. Ellen Burstyn: Requiem For a Dream, Alice Doesn’t Live Here Anymore, The Exorcist, The Last Picture Show, Same Time Next Year, Resurrection, The People vs. Jean Harris, Silence of the North, Pack of Lies, Mrs. Harris. Julianne Moore: Still Alice, Boogie Nights, Magnolia, Safe, Far from Heaven, The Big Lebowski, The End of the Affair, The Kids Are Alright, The Hours, Game Change, A Single Man, Children of Men, Maps to the Stars. Glenn Close: Fatal Attraction, The World According to Garp, Damages, Albert Nobbs, Dangerous Liaisons, 101 Dalmatians. Jane Fonda: Coming Home, Klute, The China Syndrome, On Golden Pond, The Shoot Horses Dont They? Julia Roberts: Erin Brockovich, Pretty Woman, Notting Hill, My Best Friend’s Wedding, Steel Magnolias, Eat Pray Love, The Normal Heart, The Pelican Brief, Sleeping With The Enemy, Stepmom. Shirley Maclane: Terms of Endearment, Madame Sousatzka, The Turning Point, Irma la Douce, The Apartment. Emma Thompson: Howard’s End, In the Name of the Father, The Remains of the Day, Sense and Sensibility, Harry Potter Franchise. Annette Bening: American Beauty, The Kids Are All Right, Being Julia, 20th Century Woman, Mrs Harris, The Grifters, The American President, Bugsy, Open Range, Running with Scissors, The Seige. Helen Mirren: The Last Station, The Queen, Gosford Park, The Madness of King George, Hitchcock. Nicole Kidman: The Hours, The Others, Moulin Rouge!, Dogville, Eyes Wide Shut, Rabbit Hole, To Die For, Big Little Lies (tv), Birth. Sally Field: Places in the Heart, Norma Rae, Lincoln, Forrest Gump, Steel Magnolias, Brothers and Sisters. Frances McDormand: Fargo, Three Billboards Outside Ebbing Missouri, Olive Kitteridge, Almost Famous, Blood Simple, Mississippi Burning, North Country. Kathy Bates: Misery, Fried Green Tomatoes, Dolores Claiborne, Primary Colors, About Schmidt. Kate Winslet: Titanic, Eternal Sunshine of the Spotless Mind, The Reader, Revolutionary Road, Steve Jobs, Little Children, Finding Neverland, Sense and Sensibility, Iris, Heavenly Creatures, Hamlet. Maggie Smith: The Prime of Mrs. Jean Brodie, California Suite, Gosford Park, A Room With a View, Harry Potter Franchise. Cate Blanchett: Lord of the Rings, I’m Not There, The Aviator, Blue Jasmine, Notes on a Scandal, Elizabeth, The Talented Mr. Ripley, The Curious Case of Benjamin Button, Bandits, Elizabeth: Thee Golden Age. Natalie Portman: Black Swan, Closer, Leon, Jackie, Star Wars Movies, Garden State, V For Vendetta, Beautiful Girls, Brothers, Anywhere but Here, Where the Heart Is. Sissy Spacek: Coal Miner’s Daughter, Carrie, In the Bedroom, Badlands, Crimes of the Heart, Missing, The Straight Story, The River, Raggedy Man, Tuck Everlasting. Sigourney Weaver: Alien Movies, Ghostbusters, Gorillas in the Mist: The Story of Dian Fossey, Working Girl, Avatar. Viola Davis: The Help, Doubt, Fences, How to Get Away With Murder, Prisoners. Amy Adams: Arrival, American Hustle, The Master, The Fighter, Doubt, Enchanted. Hilary Swank: Boys Don’t Cry, Million Dollar Baby, Insomnia, Amelia, Conviction. Tilda Swinton: Michael Clayton, We Need to Talk About Kevin, The Deep End, The Curious Case of Benjamin Button, Julia. Elizabeth Moss: Mad Men, The Handmaid’s Tale, Top of the Lake, The Square, The West Wing, The One I Love. Laura Linney: You Can Count on Me, Kinsey, Mystic River, The Squid and the Whale, The Life of David Gale, Ozark. Scarlet Johansson: Lost in Translation, Under the Skin, Her, The Prestige, Match Point, Vicky Cristina Barcelona, Girl With a Pearl Earring, Marvel movies, Lucy. Holly Hunter: The Piano, O Brother Where Art Thou?, Raising Arizona, Broadcast News, Thirteen. Julie Christie: Darling, Doctor Zhivago, Away From Her, Afterglow, McCabe & Mrs. Miller. *Best Actress/Supporting Actress Academy Award winning performances appear in italics.